Genesis Mining is Not Working ??? It (Genesis Mining) is actually working, however, the information was slow to update. 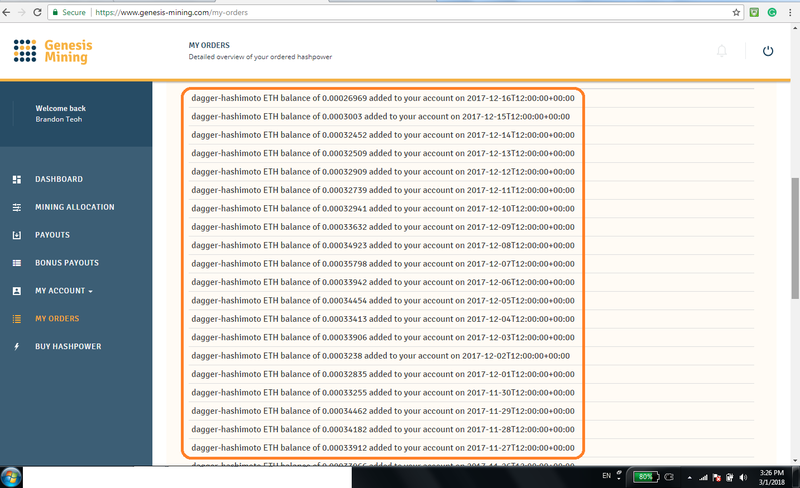 My account is actually accumulating ETH !!! Started mining contract (Ethash - Pure Ether Mining) on 15-Nov-2017 with an investment of US $65 for hashpower of 2 MH/s, I have accumulated 0.01534708 ETH which is equivalent to the US $14 based on current price of US $897.40 per ETH. In other words, with this hashpower, I've generated the US $ 14 in 50 days. 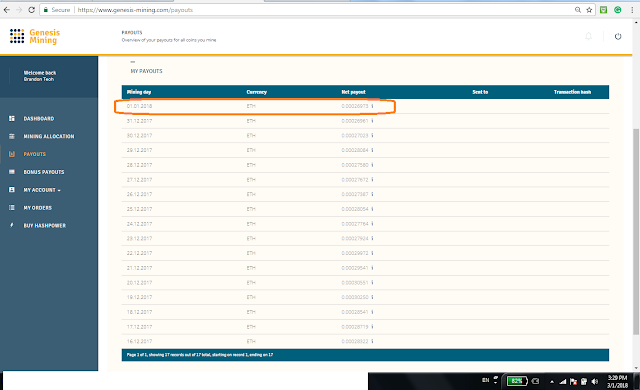 Therefore, to generate the US $ 1, I would need 3.57 days. Hence, to ROI, I would need 232 days, about 7 months - this plan is considered profitably because the subscription has a contract period of 2 years. Based on existing projection, I would generate ETH worth of US $204 in 2 years time. 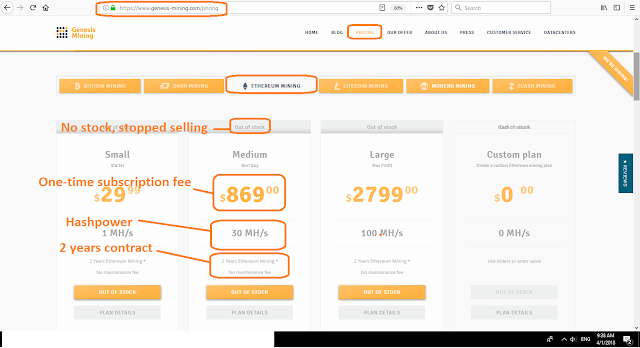 Genesis Mining offers cloud mining server - all you have to do is to purchase a one-time subscription for your choice of server plan type and it will do the job on your behalf - the listed pricings are a one-time fee and usually 2 years contract. You should try it out too, given the latest trend of cryptocurrency - an upward trend so to speak. 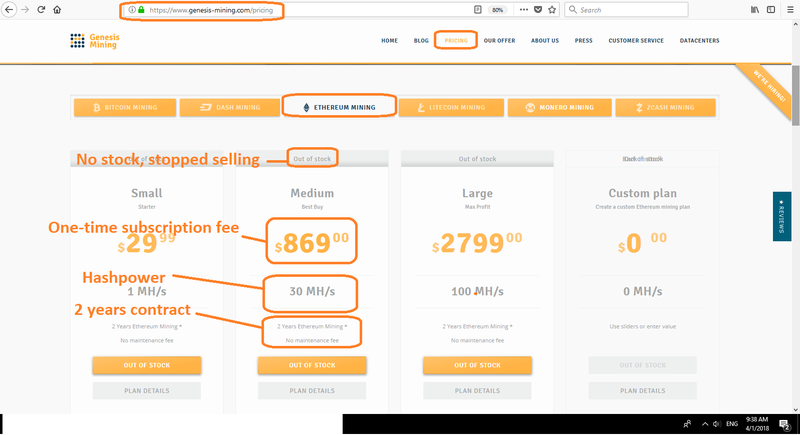 The bad news is that Genesis Mining had stopped selling the plan for ETH mining - when I did the subscription on 15-Nov-2017, I wanted to test it out even though by that time, Genesis Mining had stopped selling Bitcoin (BTC) server plan. Nevertheless, 2 years Monero Mining server plan is still available. 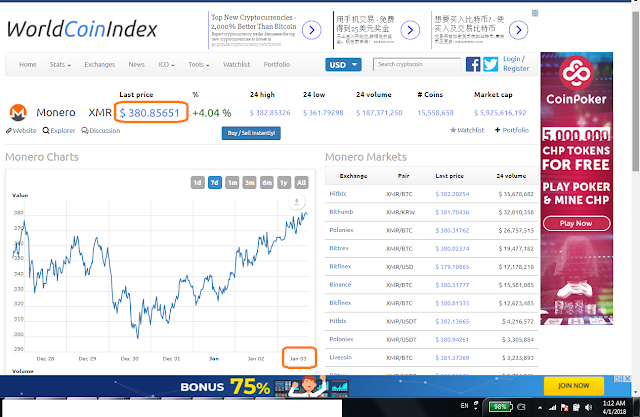 Monero Mining server plan will do mining for Monero - current price for Monero is still low, about the US $380. 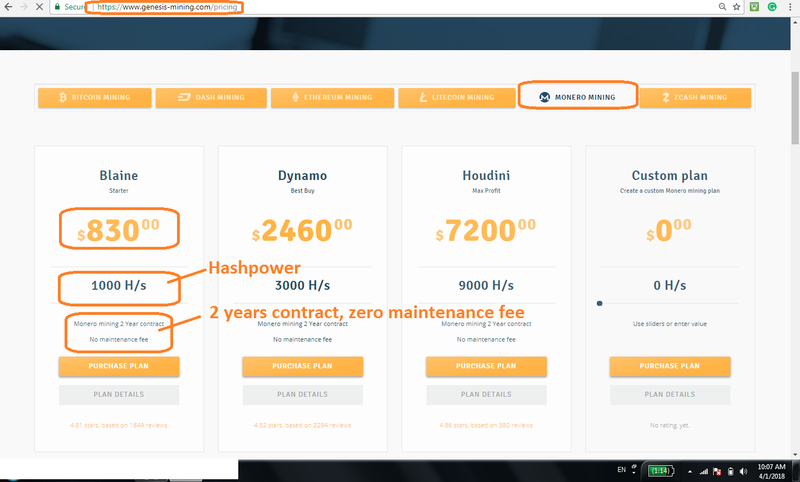 Nonetheless, the lowest server plan which Genesis Mining is offering is one with hashpower 1000 H/s for 2 years contract and it costs the US $830 - not cheap. For first time subscriber of Genesis Mining, take note that it is slow to update information, do not panic - just wait for the information to update - right after you have purchased any server plan, you may not see any activity for at least a few days as I have experienced it. 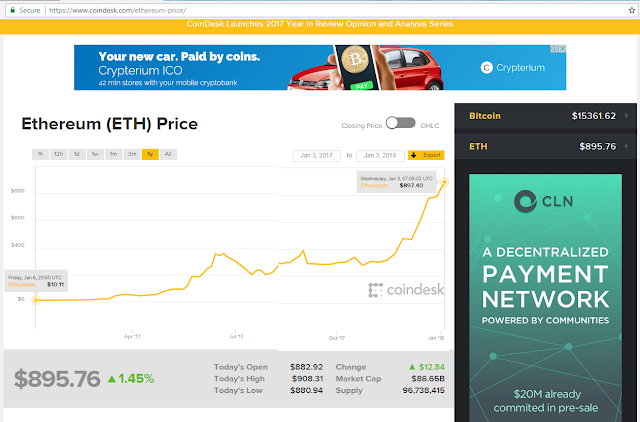 You might also want to consider mining ETH using your own server. P/S: Don't bother hacking my account, this is cryptocurrency - it is encrypted ! !